Apple and fall go together much like croissants and Paris. A perfect pair full of deliciousness. So as I was enjoying Sharon Santoni‘s most recent book My French Country Home: Entertaining Through the Seasons which showcases her home during each season in Normandy, France, I came across her Apple Tarte Tatin. 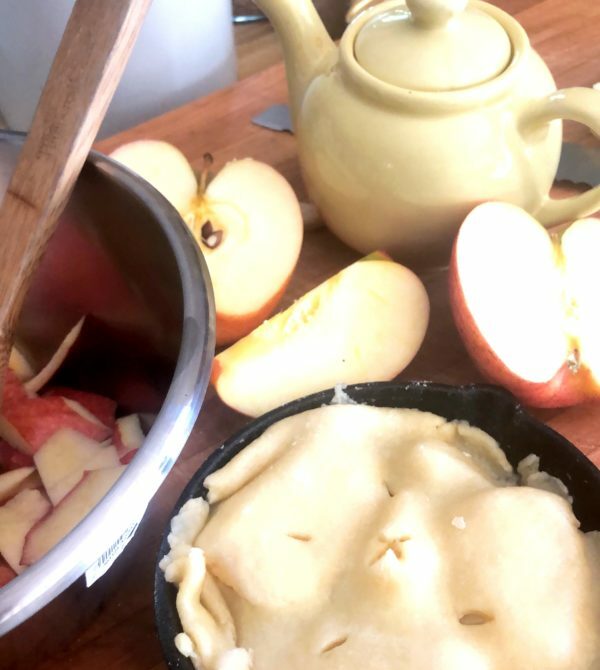 And when I saw that only three ingredients were needed for the filling and I had each of these ingredients already, I made myself mini Apple Tarte Tatins last Sunday. 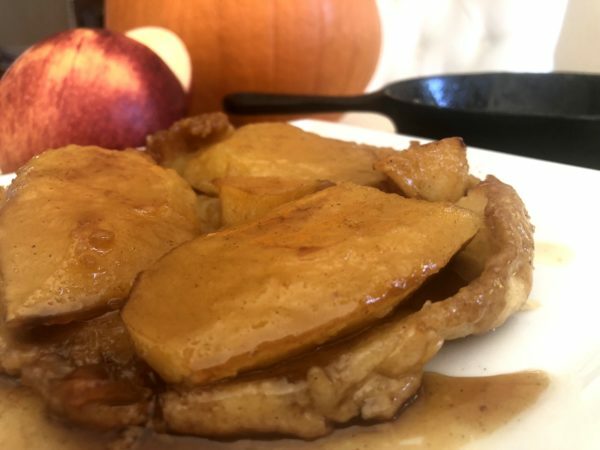 While I have made many Apple Tarts and Apple Pies, this was my first Apple Tarte Tatin, and it is now one of my favorite apple dessert recipes. I reduced the recipe and made single servings in two mini castiron skillets I picked up a few years ago. I considered putting ice cream or cream on top upon serving them, but upon taking my first bite of the Apple Tarte Tatin on its own, I immediately knew, it didn’t need any additional toppings. Yet again, simple and quality come together to create something wonderful savor and appreciate, and in this case, it can be made and enjoyed for dessert this fall. ~For more TSLL Recipes, click here. Make the pastry dough in a food processor. Combine the flour, chilled butter, sugar and salt. Then slowly add the water until the dought begins to clump. Roll into two balls and flatten into round discs. Place into the refrigerator for 30 minutes to chill. Peel and core the apples. Slice into quarters. In two small cast-iron skillets placed on the stove-top at low-medium heat, divide the butter and place into each. Melt the butter. Once the butter has melted, place the sugar into the skillets and mix until combined. 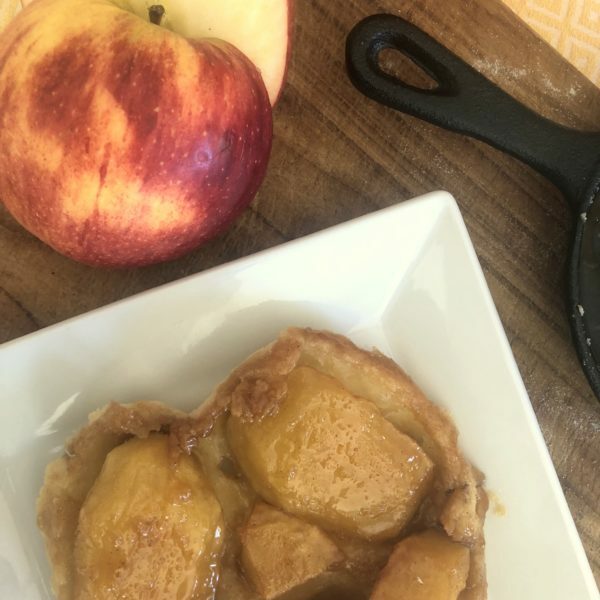 Place the apples into the butter and sugar, core side down - approximately 3 quarters per skillet (you may cut the remaining quarter into smaller sizes to fill the gaps). Cook for about 10 minutes. The butter and sugar will begin to caramelize. Flip the apples with a fork, carefully to keep them in tact. Cook for about 5 minutes more and then remove from the heat. Prepare the dough, roll out to slightly overlap the edge of the skillet. Place the dough on each skillet, tuck the sides into the inside of the pans. Place into a preheated oven (425 degrees) and cook for 20-25 minutes. Remove once the crust is gently golden brown. Remove from the oven once the crust is gently golden brown. Let cool for about 10 minutes. Then place a plate on the top of the skillet, flip and serve. These look delicious! 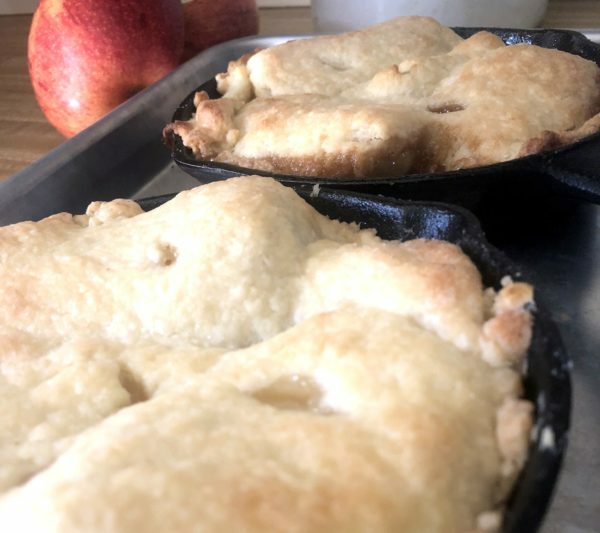 If you don’t have small cast iron skillets, do you have a suggestion for a substitute for baking these wonderful desserts? Good question! The good news is that these s,pall skillets are very inexpensive (fewer than $10). I have provided a link at the end of the post. Other options are spiny small skillet that is oven proof – a small Dutch oven, for example. Oh, that’s great! Thank you, Shannon!